2 “Do you see all these great buildings?” replied Jesus. 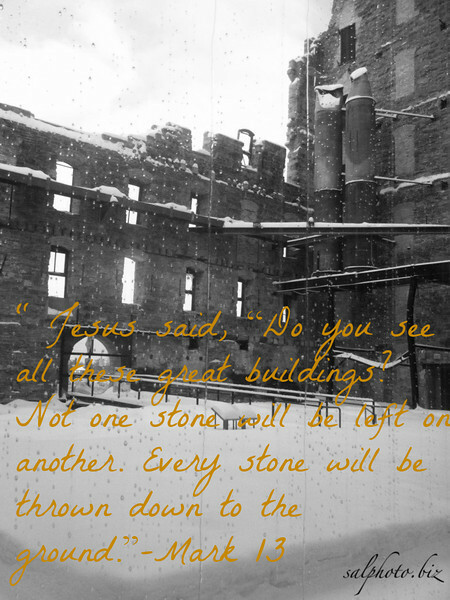 “Not one stone here will be left on another; every one will be thrown down.."
"...“Jesus left the temple and was walking away when his disciples came up to him to call his attention to its buildings. ”Do you see all these things?“ he asked. “I tell you the truth, not one stone here will be left on another; every one will be thrown down” (Matt.24:1-8 NIV). See also Lk.21:5-6....In his well known prophecy about the end of the age recorded by Matthew and Luke, Jesus predicted the destruction of the Temple and Jerusalem which came to pass 40 years after his death and resurrection. Because the disciples as most of the Jews of their day (especially the Essenes and the Pharisees) were looking for a Messiah to come who would restore national Israel, set up an earthly kingdom, and destroy the existing Temple and build a new one in its place (See Ezekiel chapters 40 to 47.... http://www.biblegateway.com/passage/?search=Ezekial+40&version=NIV), they were anxious to know when this would happen. They asked,“When will this happen, and what will be the sign of your coming and of the end of the age?” (Matt.24:3 NIV)...."
“Then the crowds spread out their robes along the road ahead of him, and as they reached the place where the road started down from the Mount of Olives, the whole procession began to shout and sing as they walked along, praising God for all the wonderful miracles Jesus had done. ”God has given us a King!“ they exulted. “Long live the King! Let all heaven rejoice! Glory to God in the highest heavens!” But some of the Pharisees among the crowd said, “Sir, rebuke your followers for saying things like that!” He replied, “If they keep quiet, the stones along the road will burst into cheers! But as they came closer to Jerusalem and he saw the city ahead, he began to cry. ”Eternal peace was within your reach and you turned it down,“ he wept, “and now it is too late. Your enemies will pile up earth against your walls and encircle you and close in on you, and crush you to the ground, and your children within you; your enemies will not leave one stone upon another- for you have rejected the opportunity God offered you.” Then he entered the Temple and began to drive out the merchants from their stalls, saying to them, “The Scriptures declare, 'My Temple is a place of prayer; but you have turned it into a den of thieves” (Lk.19:36-46 TLB)....."